Our salve for gardeners has a little secret. It is based an the wisdom of herbs and healing shared by Airmid, a goddess of the Tuatha Dé Danann. Her family were healers and surgeons. Airmid knew the secret of all of the herbs. Her recipes and blends have been passed and shared through the ages, her lessons on herbs whispered from the people and plants to all that could hear. We heard. Calendula, comfrey, rosemary, sage, basil, hemp seed and other oils, aloe, and a luscious blend of other herbs and oils combine to aid with the healing of nicks, scratches and cuts, all while softening and soothing your hardworking hands. Airmid had a fondness for gardeners. We love to garden and get our bare hands good and dirty. That's why we've created this gardeners salve with the Airmid in mind – Airmids Salve for Gardeners. Staying in shape is tough work - especially for your mat! Sweaty hands and very sweaty feet can really put a kink in your calm. 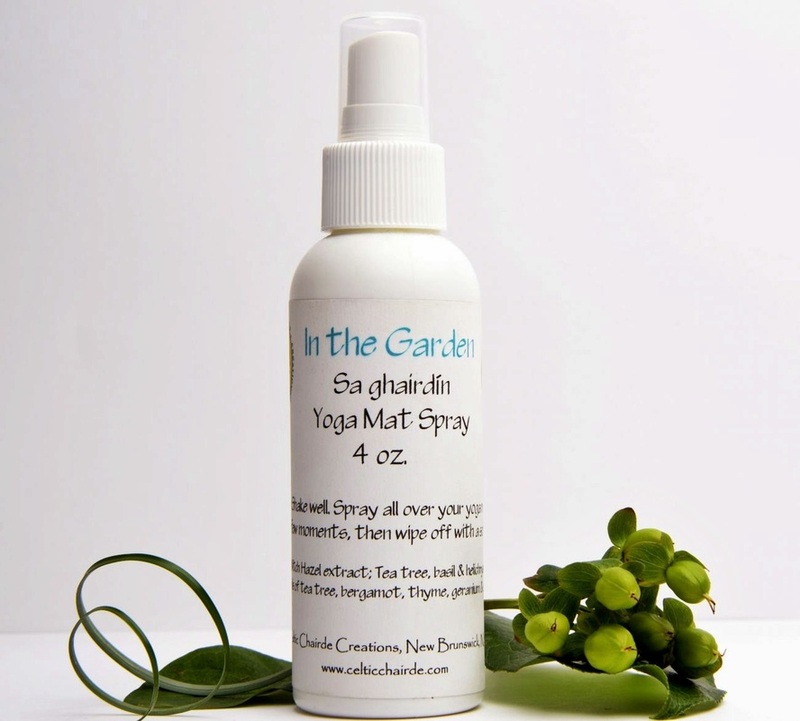 Our spray uses witch hazel, tea tree and gentle essential oils that clean your yoga and pilates mat without damaging it. The fragrance is light so as not to overpower while working. Just a light spray and wipe before or after a session to keep your mat in shape. Light and refreshing - like a walk in the garden in the early morning. Herbs, essential and other oils blend together to give your sore muscle some much needed relaxation and healing. Arnica, mints, hot pepper and sage are natures muscle and bruise healers. 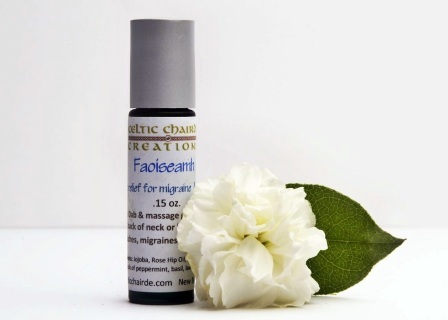 Jojoba, mango and safflower oil deliver the healers through the skin. Fantastic fragrance blends don’t make you smell like a locker room! These rubs will not feel over hot or cooling, but their nutrients will please your muscles and give you soft skin. Yummy, sweet strawberry with a kiss of fresh picked mint. Amber essence with a spicy hint of clove. 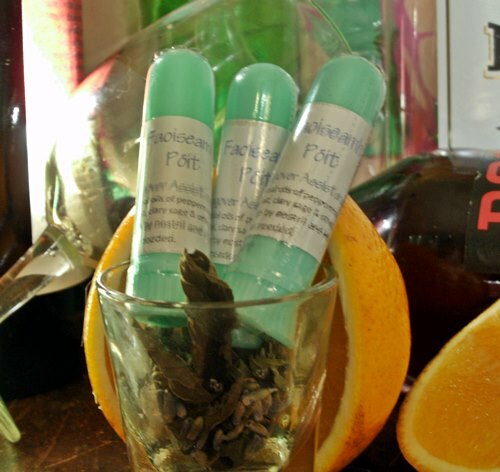 Fragrant and fresh green tea with just a touch of spirit lifting lemon verbena. This wonderful spray puts the power of apple cider vinegar, witch hazel, chickweed, peppermint and other herbs to work easing the pain of sunburn - or any burn. 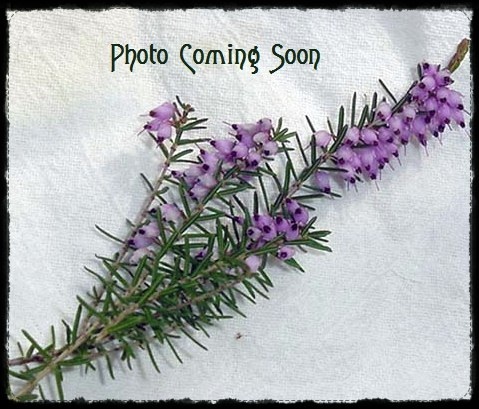 Soothing and healing, it also works well on bug bites, rashes and other itchiness. The greening of the trees and plants calls us out to the garden. There's nothing as soothing as digging down in the dirt or smelling freshly blooming flowers. But it takes it's toll on your skin. 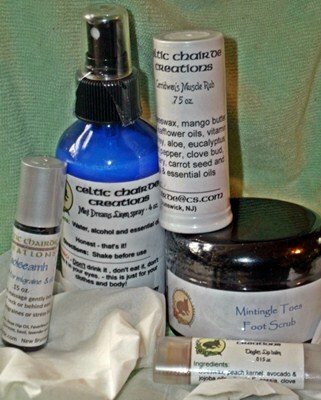 This gift pack helps keep your skin at its natural best. 1 1 oz Gardeners Salve - great for those nick's, scratches and work worn hands. 1 .75 oz Muscle Rub - Gardening puts your muscles to some extra work. This salve is powered with Arnica and capsaicn from hot peppers. Soothes muscles and smells fabulous. Choose from 4 scents. 1 8 oz Dó Gréine Spray - Don't let the spring sun fool you - you can still get burned. This all natural spray ease the pain of burns (sun or otherwise) as well as itchiness and bug bites. Even helps repel some bugs (does not work well for gnats though). 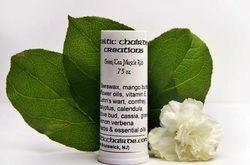 1 Sweetest Kisses Lip Balm - Honey makes this lip balm extra soothing and softening for wind and sun damaged lips. 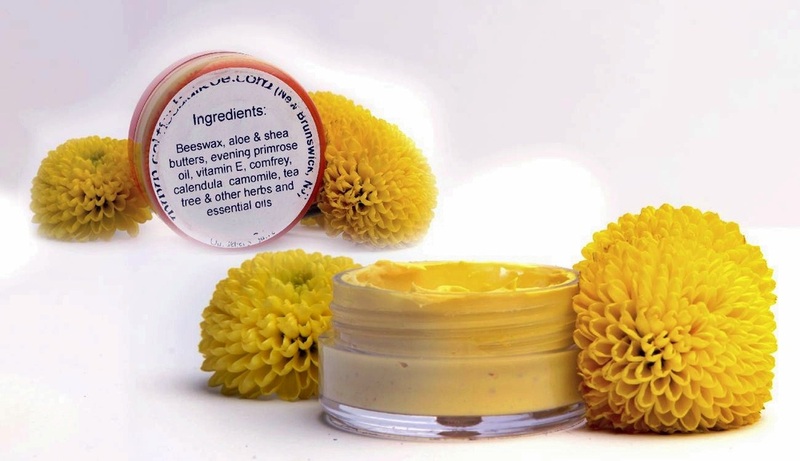 Muscle Rub has a lucious scent of ripe mango's with just a hint of pineapple. Cerridwen is a blend of natural essential oils including a hint of amber and clove. Fresh green tea and a dash of lemon verbena make this a refreshing muscle rub. 1 Faoiseamh - perfect for helping with headaches and stuffy noses. 1 Tingles - minty goodness that opens up your sinuses while soothing and healing dry, chapped, sore lips. 1 4oz Mint Dreams Linen Spray - keep that minty freshness going with this lovely linen spray. Helps in continuing to keep your sinuses open while you sleep. 1 Cerridwen Muscle Rub - this soothing and soft rub will help ease muscle tension and soreness. 1 4oz Mintingle Toes Salt Scrub - a warm tub of water and this salt scrub will soothe your feet and get you tingling all over. Please keep in mind that we are not doctors. Severe or lingering medical issues and symptoms should be addressed with your physician. Check with your doctor if you have an existing medical conditions or allergies. Keep those feet soft, relaxed and barefoot ready. Please indicate your choice of Muscle Rub and Lotion Bar in the Special Instructions section of your order form. DISCLAIMER: Because it's one of those thing we have to do. Please keep in mind that I am not a doctor and severe migraines may be related to medical conditions requiring a doctors care. Products are not meant to prevent, treat, or cure any medical condition. Consult your physician for diagnosis and treatment of any medical condition. All skin or health benefits associated with the products are for information purposes only and do not substitute for medical advice. 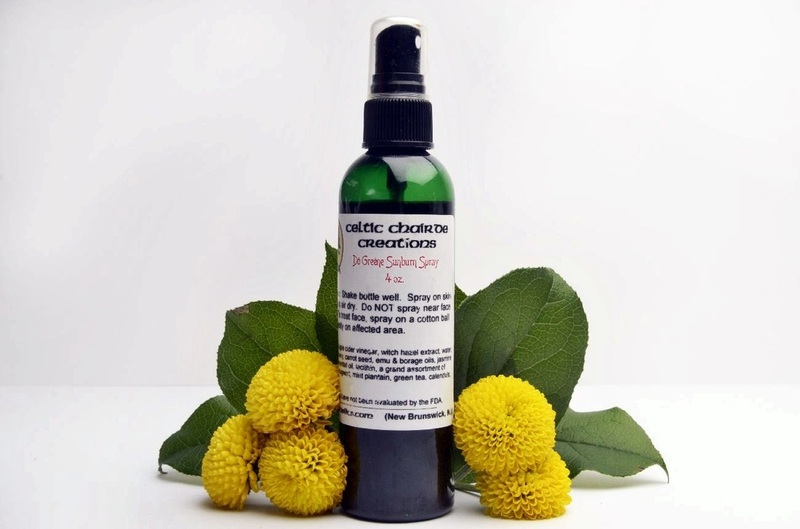 Celtic Chairde Creations is not responsible for any health issue arising or perceiving to arise from any Celtic Chairde Creations products or information given in relation to them.